If you're a trail runner in Alberta, you're in luck. There's a group for everyone. Hold your horses! (Literally, as we are now entering cowboy country.) Whether you’re exploring the Rockies or the prairies, we guarantee you will find beautiful trails and positive people in Alberta. Trail running clubs bring like-minded people together and provide fun opportunities to experience new challenges. In no particular order, we’ve listed some of Alberta’s trail running groups made up of inclusive and supportive humans. For just over two years, Calgary Trail Culture (an offshoot of Canmore Trail Culture) has been getting together for casually-paced trail runs in northwest and southwest Calgary. “We run strictly on trails and some snow-covered pavement. If any runners fall behind the group’s pace we always stop and wait so nobody is lost or too far behind. Runs involve a little adventure and a lot of talking. Runners share training strategy, gear reviews and running stories during our run breaks. Group members often plan weekend excursions and get-togethers. It’s amazing how some of these urban trails can make you feel like you aren’t in the city. Runs are usually followed by a trip to a local pub,” explains founder and organizer Matt McDonald. Fun fact: McDonald didn’t intentionally pick Wednesday nights because it’s wing night, but so far no one is complaining. Calgary Trail Runners (CTR) are an inclusive and supportive group uniting trail runners of all levels and abilities. Whether you’re “comfortable with leisurely one-hour escapades on gentle rolling trails [or] contemplating and needing to train for 100-mile plus gnarly and steep ultras on the far edges of civilization,” you are welcome. Members are regulars of the Alberta Ultra Series Circuit, and known to partake in 5Peaks and Powderface races. Fun fact: Founded by Caroline Toppazzini as a Meetup group in 2008. Nowadays, Leo Fung and Tony Gordon organize the masses and fuel off of candy and Oreos. $5 voluntary donation to join, which is cheaper than therapy. Organized by Michael Fitzpatrick, Canmore Trail Culture unites trail running enthusiasts to run and explore the Bow Valley area. Fun fact: The group is part of the Canmore Trail Alliance, which fosters community engagement, volunteer participation, and education in Kananaskis Country. In 2015, Canmore trail and ultrarunner Andy Reed felt like he needed some motivation to get out for some speedwork. He decided to create a trail running group, which has grown from eight to over 30 runners. The format involves a structured one-hour interval session, allowing everyone to run at their own level and pace. Everyone is welcome, no matter their ability. Fun fact: The group meets year round, regardless of the weather. After the workout, the group often has a beer and food in downtown Canmore. In five short years, Sheryl Savard has created and grown Edmonton Trail Runners (ETR) from nothing to over 2,200 members. The urban trail running community encourages trail adventures at any pace. It is kid-friendly and dog-friendly, and a place for people to leave their ego at the trailhead. “When I started ETR, I just wanted a dozen or so people that I could run trails with: first, for safety; second, for inclusion–I wanted new people to feel like they had a place to connect with others even if they didn’t know anyone; and third, for diversity–I wanted males and females to equally feel comfortable showing up, for every pace from social to elite to have a great experience, and for new to experienced athletes to enjoy the adventure of trails together,” explains Savard. When: A variety of options most days of the week. For example, Tuesday Campfire Runs at 6:30 p.m. Saturday Snakes and Ladders (looped run) at 8:30 a.m..
Fun fact: The group also organizes special events. Last year, 100 people embarked on the Triple Crown Challenge (three mountains in one day). Fun fact: Organizer Dean Johnson is also the co-race director of the Lost Soul Ultra in September, which fills up within an hour. This year, the race is introducing a new 200K event, in addition to their 100-mile, 100K, and 50K race distances. Johnson says runners who have attempted the Barkley Marathons say that the Lost Soul is very tough. Meagan Hayashi thinks Hinton is a trail-running paradise, and wants to share her passion with others. She created Hinton Runners to bring people together in order to learn the trail network in Hinton, Alta. maintained by the Hinton Mountain Bike Association. Everyone is welcome, and the group splits off into different pace groups depending on who shows up. When: Thursdays at 7:20 p.m.
Fun fact: Hayashi was inspired by a similar trail running group in Edson, Alta. created by Chantel Rivard. 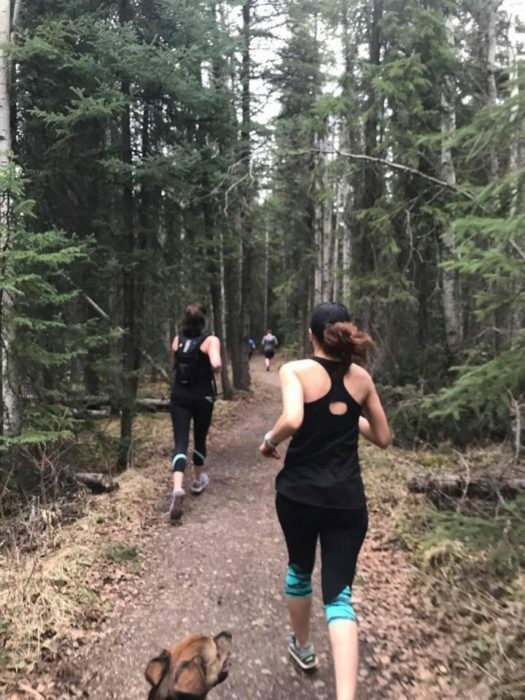 Chantel Rivard is building the trail-running community in Edson, and is keen to bring people together for weekly trail runs. Everyone is welcome. Susan Lowe-Wylde, a kinesiologist and exercise physiologist has been running for over 47 years. She has created two seasonal trail running groups in 2015 out of Spry Running store in Crowsnest Pass. Where: In and around Crowsnest Pass, Alta. Fun fact: Lowe-Wylde is unconditionally supportive and embodies what the trail running community is all about. Come experience this group for yourself! Created by Krista Mitchell, “The Triple Terrain Trail Trekkers (TTT) is a diverse group of Rockstar athletes, striving for personal success and accomplishment! Each athlete has their own story, their own challenge and their own goal.” TTT believes that people are better together, and they support each other to overcome challenges and accomplish goals. Fun fact: In addition to the weekly run groups, TTT offers organized fun runs three to four times per year. Fun Run themes include an ice cream run or reindeer romp. The group also organizes special events. Last year, 100 people embarked on the Triple Crown Challenge (three mountains in one day). For something a bit different and off the single track grid, check this out.